The Canadian 24-Hour Movement Guidelines for the Early Years were developed by the Canadian Society for Exercise Physiology (CSEP), the Healthy Active Living and Obesity Research Group (HALO) at the CHEO Research Institute, the Faculty of Physical Education and Recreation at the University of Alberta, the Public Health Agency of Canada, ParticipACTION and a group of leading researchers from Canada and around the world, with input from over 600 national and international stakeholders. To view the complete Canadian 24-Hour Movement Guidelines for the Early Years click here. 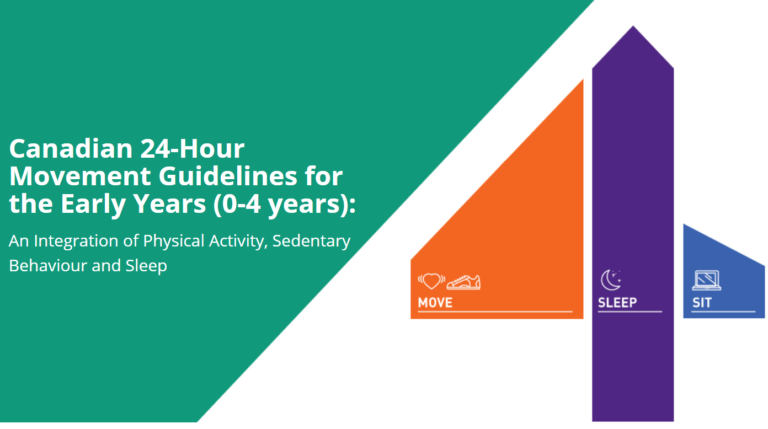 The Canadian 24-Hour Movement Guidelines1,2 combine physical activity, sedentary behaviour and sleep guidelines to show the interrelationship between all three behaviours. Below are the sleep guidelines brought forward for children and youth from birth to 17 years of age. Toddlers (age 1-2 years): 11 to 14 hours including naps, with consistent bedtimes and wake-up times. Preschoolers (age 3-4 years): 10 to 13 hours including naps, with consistent bedtimes and wake-up times. Children (age 5-13 years): 9 to 11 hours of uninterrupted sleep, with consistent bedtimes and wake-up times. Teenagers (age 14-17 years): 8 to 10 hours of uninterrupted sleep, with consistent bedtimes and wake-up times. The Canadian 24-Hour Movement Guidelines for Children and Youth (5-17 years) were developed by the Healthy Active Living and Obesity Group (HALO) of the Children’s Hospital of Eastern Ontario (CHEO) Research Institute, the Canadian Society for Exercise Physiology (CSEP), ParticipACTION, The Conference Board of Canada, the Public Health Agency of Canada and a group of leading researchers from around the world, with the input of over 700 national and international stakeholders. 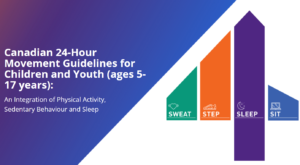 To view the complete Canadian 24-Hour Movement Guidelines for Children and Youth (ages 5-17 years) click here.